When 16-year-old South African Tobela Gqabu applied for a bursary to complete his schooling at the Lawhill Maritime Centre at Simon’s Town School, he’d never seen an actual ship. In fact, he lived in a rural village almost 200 kilometers from the South African coast. But he didn’t let this stop him from pursuing a career in the maritime industry. At the age of 28, Tobela Gqabu became the Centre’s first internationally-qualified Master Mariner, having obtained his Master’s Certificate of Competency or Class 1 maritime qualification. 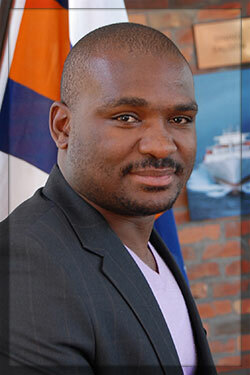 After several years at sea, he currently works ashore as the Principal Officer for SAMSA, the South African Maritime Safety Authority, in East London. He plans to return to sea when the right opportunity comes along, ideally to take command of a product tanker. The TK Foundation-funded Centre is one of the few maritime training programs in the world that works with students at the secondary school level, equipping them with maritime knowledge, and increasing their prospects for after-school employment.“I have aspired to command a ship for so many years and it remains a dream which I would like to turn into reality,” he explains. Like Tobela, the majority of the Centre’s students come from financially-stressed homes, and are reliant on scholarships provided by the maritime and related industries to fund their education from Grade 10 to 12. Lawhill’s track record is one of real upliftment and empowerment, not only for individual young people, but also entire families. Blondie Jobela, a recent graduate, would agree. She is currently blazing trails serving as a Third Engineer with the Royal Caribbean Cruise Lines. She has also inspired her two younger brothers, who both attended Lawhill, to follow in her footsteps by embarking on a career at sea. One is a navigating cadet with Unicorn Shipping and another is studying marine engineering. Since its inception, more than 300 young South Africans have passed through the Lawhill program, many of them pursuing successful careers in the maritime industry, both ashore and at sea, while others have gone on to make their mark in other industries. To learn more, please visit www.lawhill.org.